I really like this image. It is a clever image. A manipulative one - good photography and marketing should be. But I think it is important to know when you are being manipulated. 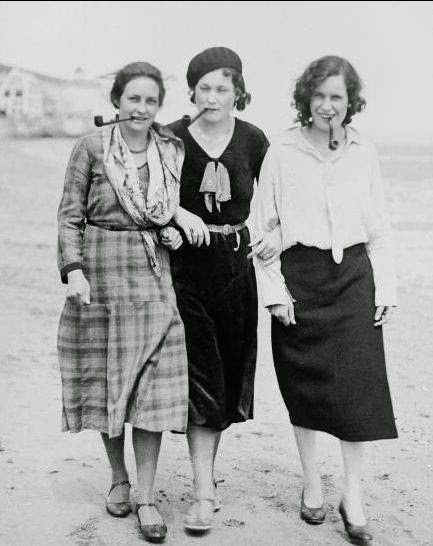 And this image entitled, "Rosa Luxemburg, Simone de Beauvoir, and Emma Goldman at the beach, 1930s manipulates on many levels. One of the many problems with the image is that the women's rebellion- smoking pipes- was something the tobacco industry had planned. If you look at this image and think, "attractive rebellion," you have been manipulated. You have reacted in the way the marketing company wanted you to. You had been manipulated by Edward Bernays into believing smoking = freedom/rebellion etc. Bernays was employed by the tobacco industry to widen a saturated market. He used women dressed as suffragettes and women enjoying their "freedom" to bring the cigarette out into the open. Like youth culture ambushed; rebellion that had been real - against staid, adult, middle class run society, capitalist society latched on and sells the rebellion back. Recently, rock ' n' roll, mods, ska, punk, emo, goth etc - have all been latched on to by capitalist society and sold back to us. Tamed and used as devices to sell stuff. The three women supposedly walking on the beach never met - that was impossible. This was a tobacco promotion photo. Interesting though, that it has been rehashed and sold as something it clearly cannot be. Bernays "Torches of Freedom" campaign still rolls out today, it's success from its inception in 1929 is proven by the statistics of women smokers and the women in respiratory units in hospitals across the world. Like most marketing, how "rebellion" is sold to us is exploitative. And the biggest exploitation comes with the legal drugs industries tobacco and alcohol and aimed at young people going through rebellion and identity formation. Watching how "vapers" are manipulated into believing they are in control and are not harming themselves is the most recent Bernays style manipulation. "I'm being healthier." "I'm harming no-one." "This is my right!" The most insidious aspects of Marlboro man and "Freedom Torches," have returned, though the smoking indoors is being sold as the new "freedom." I think as bad as this is, alcohol marketing is insidious. Alcohol has one immediate effect -drunkenness, and many after effects that cause disease and debilitation But it is marketed at different sections of society in subtly different shades of "decadence." White Lightening Cider, spirits with gold floating in them, creamy liqueurs, real ales, wine snobbery, Saturday night beers, Friday night glass of red wine, Friday night luminescent teenage fizzy pop and Glasgow street wines -all targeted at people to make them think, "fun," "decadence," "rebellion" "identity" and necessity. This stuff is necessary to have fun on a beach, in a club, sitting by a warm fire, with a gourmet meal, with a curry, swirling in a glass while uttering meaningless adjectives. If the risks to your health don't worry you; these drugs that are the biggest killers we ingest, perhaps you should think about how you are manipulated to ingest them. Once you start noticing how our society sells you these things, maybe you will rebel. The interesting thing about this image, is how many people buy into it, even if it was not "re-imagined" as the three women it impossibly places together. How many people are manipulated by the "rebelliousness" of the three obviously reasonably well off, pretty women with their pipes? The photo was taken at a time when women were taking back their rights from a skewed society - but the skewed society was using this fact to sell tobacco. The image crops up across the net - and has done for a few years - I reposted it on facebook a few years back. It is attractive, but it is selling something in a very clever way.